Some ranchers say the rangeland conditions are the worst they have ever seen. Grave concern for California ranchers facing a prolonged dry spell this winter has prompted UC Cooperative Extension to organize meetings for ranchers in Mariposa, Mendocino, San Luis Obispo, Kern, Ventura and Tulare counties to connect remotely to a UC drought workshop in Browns Valley Jan. 29. The workshop, “Mitigating Drought: Optimizing Pasture and Supplemental Feed and Managing Risk,” takes place from 9 a.m. to 3:30 p.m. at the UC Sierra Foothill Research and Extension Center, 8279 Scott Forbes Rd., Browns Valley, Calif. Three UCCE advisors, two UCCE specialists, a veterinarian, a rancher, an insurance agent and a Cattlemen’s Association representative will discuss supplementing with alternative protein and roughage, managing animal health, making culling decisions and other topics that will help keep ranchers in business through what is shaping up to be the worst drought in California history. The complete agenda is posted online. "From previous droughts we've learned that feeding the whole herd through the drought may spell the end of business," said Glenn Nader, UC Cooperative Extension advisor in Sutter-Yuba Counties. "We plan to provide information on management options and impacts of drought on dryland range and irrigated pasture, feeding options to consider during a drought and how to decide what cows to sell." Nader is organizing the workshop with Jeremy James, director of the UC Sierra Foothill Research and Extension Center. To register for the meeting in Browns Valley, complete this online form. Registration is $10 and includes lunch. In Mariposa County there hasn’t been any significant grass growth in most areas this winter. Some of the annual grass seedlings that germinated with November and December precipitation are dying due to the lack of rainfall in subsequent weeks. ”Most ranchers in Mariposa County report that this is the worst fall and winter season they have seen for as long as they have ranched in the area,” Mashiri said. Ranchers are currently supplementing with hay, molasses and alternative feeds like almond hulls in order to maintain body condition and hoping the rain will come soon. 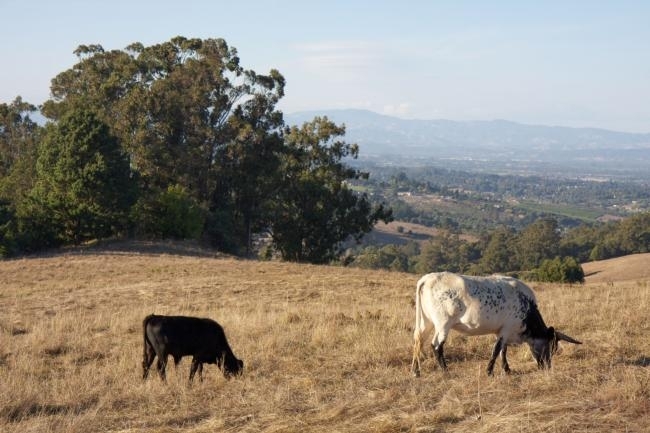 During the Browns Valley field visit, participants in the Mariposa County meeting will share ideas about practices that have worked for some ranchers and discuss issues that may have come out during the webcast. Early precipitation germinated many of the range grasses and clovers in Mendocino County, but they have since dried off. As a result, the seed bank may not be sufficient to grow enough feed even when or if rain falls in the spring, said John Harper, UCCE advisor in Mendocino County. Local cattlemen and cattlewomen are stockpiling hay and starting herd reductions. “One rancher said he already sold off 50 percent of his cow herd to be able to afford feeding the rest,” Harper said. The drought also comes at a bad time for sheep raisers. “Lambing is in full swing, so producers are forced to feed pellets or hay so ewes will have adequate milk. Without green grass lambs won’t gain weight and won’t be ready for spring markets,” Harper said. The Mendocino meeting will be at the UC Hopland Research and Extension Center, 4070 University Road, Hopland, from 8:45 a.m. to 3:30 p.m.
Local speakers at Hopland include Harper, Katie Delbar and Karri Bartolomei, USDA Farm Service Agency, and Carre Brown, First District Supervisor for Mendocino County. A registration fee of $10 per person will cover handout materials. Participants are invited to bring sack lunches and participate in discussion over the noon break. Beverages will be provided. To register, complete this online survey. The 2012-13 rain season in San Luis Obispo County was worse than in other parts of the state. Because of that, ranchers sold many cattle last spring, said Royce Larsen, UCCE advisor in San Luis Obispo County. Larsen said San Luis Obispo ranchers are either feeding their cattle supplemental feed, or selling off more, if not most, of their herds. The meeting in San Luis Obispo County begins at 12:30 p.m. at the UCCE office, 2156 Sierra Way, San Luis Obispo. After the webcast concludes at about 3:30 p.m., Larsen and other experts will provide local information. The meeting is free and advance registration is not required. Some Kern County ranchers had to cull up to 75 percent of their cattle herd last year, reported UCCE advisor Julie Finzel. Many will be facing a similar situation in 2014. “Currently there is little to no green feed on the ground, only remnants of last year’s reduced growth,” Finzel said. The meeting will run from 9 a.m. to 3:30 p.m. at the UC Cooperative Extension office, 1031 South Mount Vernon Ave., Bakersfield. Cost is $10 and includes lunch. Register online at http://ucanr.edu/dweb. In addition to the problems with little to no feed growing on rangeland in Ventura County, the drought has also impacted stockwater quality and quantity, which has caused additional problems. The UC Cooperative Extension office is hosting a seminar on Jan. 29 to celebrate the organization’s Centennial, so the ranchers’ meeting is being coordinated by the Ventura County Farm Bureau and the USDA Natural Resources Conservation Service. The meeting will be at the farm bureau office, 5156 McGrath St. in Ventura. Lunch is sponsored by the Ventura County Cattlemen’s Association. The session includes the 9 a.m. to 3:30 p.m. webcast from Browns Valley and, during the 40-minute field trip in Browns Valley, a beef quality assurance training video. There is no charge. Contact: Fletcher Nelson, USDA-NRCS Range Management Specialist, (661) 945-2604, Ext. 111, fletcher.nelson@ca.usda.gov. Tulare County ranchers may gather at the UC Veterinary Medicine Teaching and Research Center, 18830 Road 112 in Tulare, to view the workshop webcast. The cost is $10 per person, payable at the door. Register online at http://ucanr.edu/dweb. Critical information is totally absent from this article and all others I have read. The drought has exacerbated long term degradation of water resources. The drought is not the cause of the immediate emergency, the cause is the long term exhaustion of water resources as existential demand for water consumption has grown inexorably over the past century or so. When water is removed from an aquifer faster than it is replenished the exhaustion of that aquifer is a mathematical certainty. The larger the aquifer the longer the process will continue, and the greater will be the demand for existential consumption of the water extracted, but the end result is inevitable, and catastrophic. And the aquifers are in long term decline, and groundwater tables are dropping. The following are a few examples among many papers.